March 14th – 23rd: Hanatoro Illumination in Higashiyama. This is one of the biggest illumination events in Kyoto. Streets in Higashiyama Area will be lit up beautifully with flower arrangement displays created by Ikenobo group. Please check “Hanatoro: March’s Best Illumination Event in Kyoto” for details. Place: Higashiyama Area including Yasaka Shrine, Kiyomizudera Temple, Kodaiji Temple and Chionin Temple. Access: From Kawaramachi Station (Hankyu Line) and Gion Shijo Station (Keihan), walk east for 15 minutes (Yasaka Shrine). Kiyomizudera Temple will light up its buildings and premises during the Hanatoro. Train – From Kiyomizu Gojo Station (Keihan Line), go east for 15 minutes and climb Gojozaka Slope. Chionin Temple will illuminate a building called Yuzenen, which was built to commemorate the achievement of Yuzensai Miyazaki. He created the new method to dye fabrics in the Edo Period (1603 – 1868). Yuzenen is surrounded by a beautiful Japanese traditional garden which is also lit up. In addition, projection mapping will be provided on the Sanmon Gate (FREE!). For those who don’t know what the projection mapping is, check the following video. Train – From Higashiyama Station (Subway Tozai Line), 10 minute walk. Kodaiji is famous for having illumination events. During the Hanatoro event and while the cherry blossoms are beautiful, Kodaiji will be worth visiting day and night. Train – From Kawaramachi Station (Hankyu Line) and Gion Shijo Station (Hankyu Line), walk east, go through Yasaka Shrine and Maruyama Park and walk north for 20 – 25 minutes. Nijo Castle will hold an illumination event during spring. 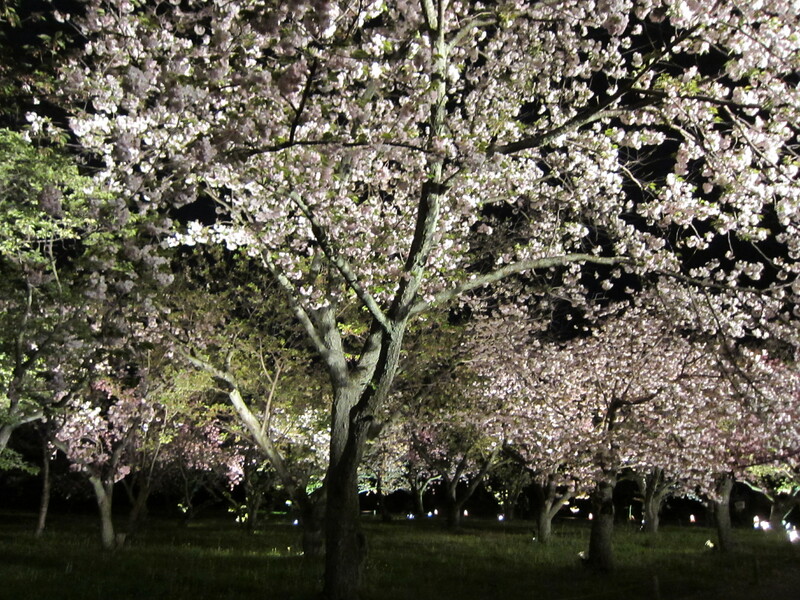 For pictures taken last year at this event, please check “Illuminated Cherry Blossoms at Nijo Castle“. Train – 1 minute from Nijojomae Station (Subway Tozai). Cherry blossoms along Shirakawa River will be gracefully illuminated. This is the sole illumination event in Gion District. And it’s free. It can be the most romantic Sakura scenery in Japan. In addition, visitors can take a picture with Maiko/Geiko from 14:30 – 17:00 on April 2nd, which is also free. Train – From Kawaramachi Station (Hankyu Line) or Gion Shijo Station (Keihan Line) walk east. For more fun, useful and unique information to make your trip special and memorable, please check our Kyoto e-Guidebook.